Advanced Water Technology (AWT) build the Al Khafji Seawater Reverse Osmosis SWRO Desalination Plant, which is the world's first large-scale solar-powered desalination plant. It is located in Al Khafji to the north-eastern part of Saudi Arabia near the Kuwait border. The desalination plant was completed by late 2017. 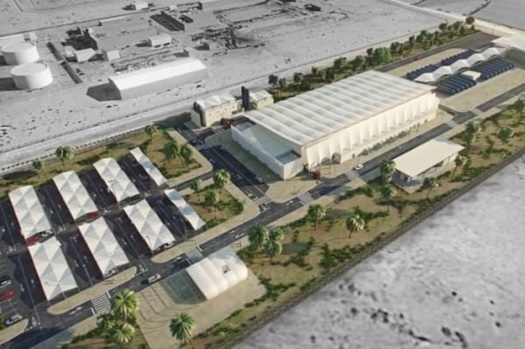 It will supply 60,000m³ of desalinated seawater a day to the city of Al Khafji in north-eastern Saudi Arabia, providing a regular supply of water to the region throughout the year. The facility will employ the new Solar Saline Water Reverse Osmosis (Solar SWRO) desalination method using ultra-filtration (UF) for the pre-treatment process. Seawater is collected from the surrounding Arabian Gulf . Seawater is collected below water level and flows into a riser and GRP pipes with a length of 2,100 meters towards the shore. The seawater is pumped to the plant to be converted into potable water. With seawater, a variety of marine fouling organisms enter the intake system. Intake structures are in general ideal environments, providing optimal conditions for settlement and growth of biofouling organisms and for this reason a biocide is introduced at the seawater intake. However, the use of hypochlorite to control biofouling should be minimized to prevent increased fouling on the RO membranes. Therefore continuous dosing is not the preferred option. Shock dosing has been trialed and has been found not to be effective in preventing marine growth in a seawater intake system. For this reason an effective (non-continuous) dosing regime to prevent marine growth and fouling at the membranes is required. H2O Biofouling Solutions (H2O BFS) provided the biofouling control specifications for AWT. The specifications are based on our EcodosingTM methodology. Ecodosing provides a biofouling control procedure which is based on local conditions; local biofouling species, intake seawater conditions, seasonal seawater quality variations and the intake system design. Ecodosing takes advantage of the natural life cycles of local biofouling organisms (e.g. mussels, oysters and barnacles). By measuring their response to biocides, the most effective dosing time interval and concentration can be determined. Ecodosing is a proven method of biofouling growth prevention and has been applied at many different industrial sites around the world over the past 20 years. 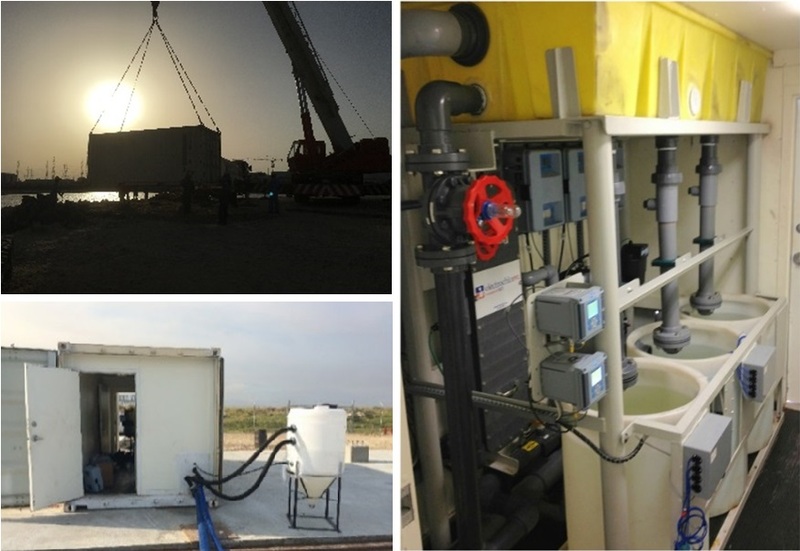 H2O Biofouling Solutions carried out a study at Al Khafji site using their mobile laboratory to determine the Ecodosing regime. Biofouling organisms were collected from the surrounding sea and used in the test laboratory. 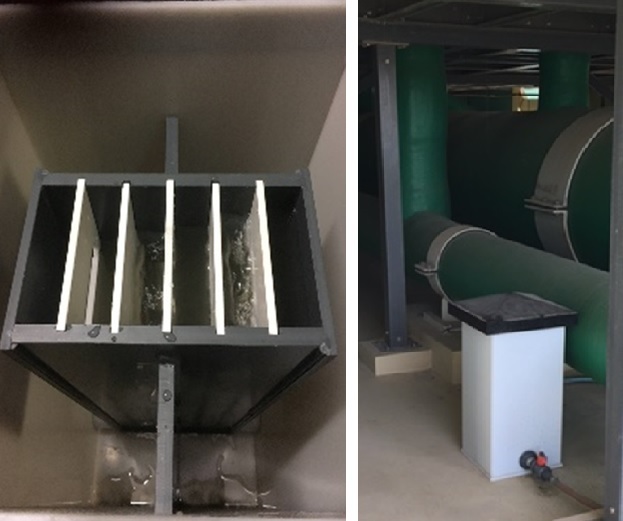 After four weeks of testing, the optimal time interval and free chlorine concentration to prevent marine growth was defined and implemented at Al Khafji seawater intake. The Ecodosing chlorine dosing regime was implemented in November 2017. The required amount of chlorine dosed could be reduced with 50% in comparison to an effective continuous chlorination. A biofouling monitor was installed to provide operators with real time insight into any risk for biofouling settlement. In the first 4 months of operation the seawater intake system stayed clean and free of marine growth. This was also noted in the biofouling monitor. H2O performed a detailed study at site in 2017 and the Ecodosing regime was implemented at the end of 2017. 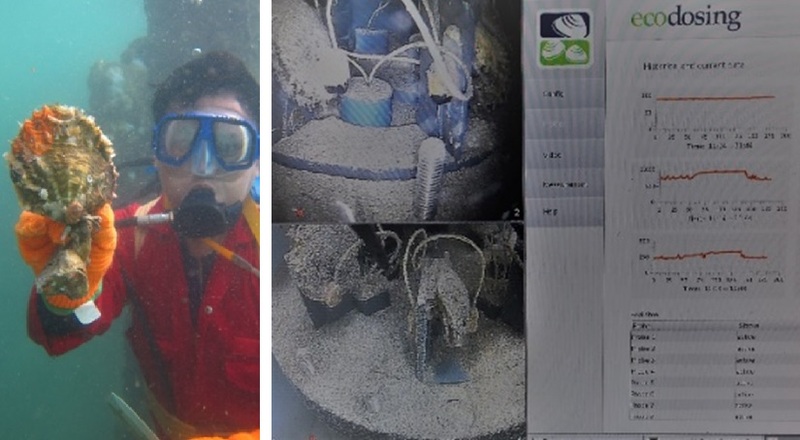 The biofouling monitor has been free of fouling since the start of the study. The results give us a lot of confidence that Ecodosing is performing very well. Also, the performance SWRO membranes have not given any indication that biofouling is occurring on the membranes. Other than at the SWRO plant in Al Khafji, the Ecodosing regime has been implemented at our Al Fatah SWRO plant in Jubail. H2O performed a similar detailed study in 2017 for this location. In the past, heavy biofouling of membranes had been observed when water was being drawn from the common Marafiq seawater intake channel. This water was chlorinated continuously. Since the implementation of Ecodosing, no impact on the RO membranes has been observed.